I´ve been treating a very bad headache with TV. And after 24 hours of treatment it´s gone! Here are some goodies out of the my “care package”. Homeland! I´ve just started to watch it so please don´t spoiler attack me! Nothing beats Back to the future though when I´m feeling blue. After that the ever so intense movie Baby Doll Wowzers! I also watched some Cosby episodes (on this you can spoiler attack me as much as you want, I know how it ends). Last but not least I saw this little jewel. “Life in stills ” a documentary about Pir-Or, a photo house in Israel. By Tamar Tal. You Swedes can watch it at SVT play. Åh homeland, lyx att du har det framför dig. Så har du sett färdigt den lagom till att de nya avsnitten släpps. Efter första avsnittet visste jag att jag skulle streck-se serien. precis vad jag behövde -lite action. och carrie e ju så bra!! Johanna! hej igen. du måste kolla på det lilla youtube-klippet av babydoll. så bra. om du inte redan sett filmen dvs. Do you know ‘Breaking Bad’? If not, try to get your hands on the dvd’s. Best tv-medicine ever! Herma! Oh yes! I´ve heard many good things! Will do. thank you! hi jenny, i’m curious seeing your very best picture ever taken! 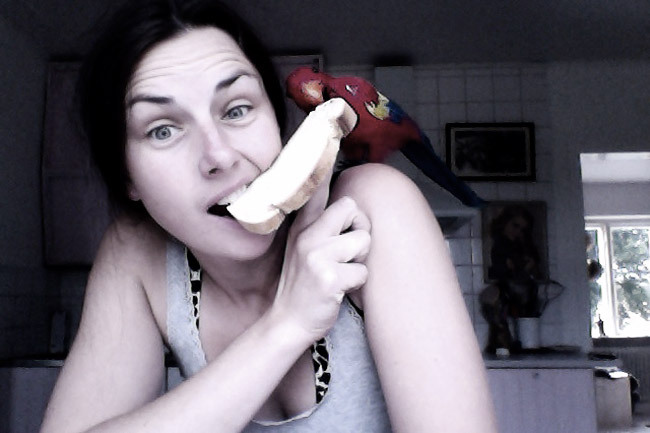 The parrot looks hungry!!! At the time I’m also obsessed with a tv series “Two and a half men”. And it’s 10 seasons!!! So… many hours on tv!! !